MLB The Show 17 update 1.04 for PlayStation 4 is now available for download. The latest update includes the fix for several issues that caused players to freeze or get stuck in certain situations. The MLB The Show 17 update 1.04 also makes improvements to the catcher’s blocking ability, addresses crashing and fixes an issue where a pitcher would be pulled even with a low pitch count. Check out full details below. Fixed several issues causing users to soft lock, freeze or get stuck in certain situations, both on the field and in the pause menu or bullpen screens. Improvements made to the Catcher’s blocking ability including the prevention of balls travelling through the player. Various general gameplay and transition improvements. Adjustments made to limit the power on opposite field HR’s as well as inside/outside swing types. Previously unobtainable icons will now unlock correctly. The level up animation no longer remains on screen while redeeming missions. Franchise in-game ticker stat tracking. Corrected batter and walkup stats in the Postseason. Fixed several instances of incorrect Team or Division logos appearing. Prevented slide outs and Defensive Shift menus from overlapping. 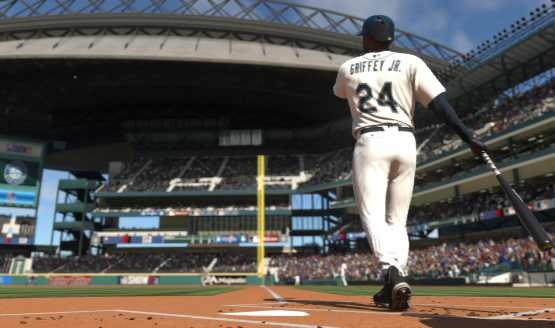 MLB The Show 17 update 1.04 added MPH and pitch info to score bar in CPU vs CPU games. Adjustments to Pregame lineup screens. Completed Programs no longer incorrectly display “Feed Me” icons. Corrected the foul pole areas in BOS and CIN to improve play calling/scoring. Swapped the Home and Away Miami bullpens. Fixed new Wrigley Field LED boards to display pitcher W/L records. The New York Mets “7 Line Army” now appears in Season/Franchise game modes. Citi Field’s grass anomaly down the right field line has been fixed. Corrected Houston and Old Miami distance markers on the HR walls. Adjusted the bullpen camera in multiple stadiums to prevent clipping issues. Graphical corrections and improvement to Old Miami (concourse areas) and Wagonman (warning track). Diamond Dynasty created player stat tracking and Ritual Item boosts now function correctly. Various RTTS Manager Interaction and player progression fixes. RTTS and Franchise mode adjustments we made to correct issues that were preventing some users from progressing naturally. MLB The Show 17 update 1.04 fixed an issue where the CPU would pull starting pitchers with low pitch counts. Fixed and issue where songs put into “Sounds of the Show” would not save correctly. Corrected arm action and animations for many pitchers including Clayton Kershaw, Tom Seaver, Michael Wacha, and others. Audio adjustments to commentary (RTTS milestones), public address announcer, and overall sound effects. MLB The Show 17 update 1.04 for PlayStation 4 size is around 1.75GB.